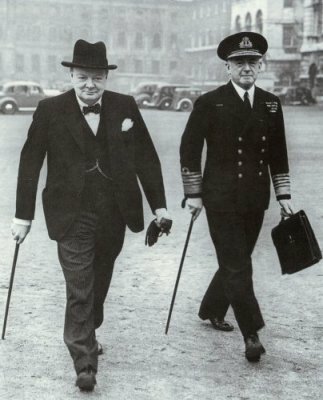 Churchill and his First Sea Lord, Admiral Sir Dudley Pound, worked extremely well together and very closely in battling the German battleship threat in 1939-1940. When Churchill became Prime Minister, Churchill had every faith in Pound in combating the German U-boat menace. Pound was an experienced Royal Naval officer; he commanded a battleship in the 1916 Battle of Jutland and held the appointment of Commander-in-Chief of the Royal Navy�s Mediterranean Fleet, 1936-1939. Pound was appointed First Sea Lord and Chief of the Naval Staff shortly before Britain declared war on Germany on September 3, 1939. Pound knew how to deal with the idiosyncratic Churchill and stood his ground to Churchill when the latter made improbable or impossible Naval strategy suggestions. For this, Churchill admired Pound. Admiral Pound died while holding office in 1943 and was succeeded as First Sea Lord by Admiral Sir Andrew B. Cunningham.